As an estimated 160 far right supporter gathered in Aarhus, Denmark today for an English Defence League (EDL) led conference to build a pan-European movement against what they see as problems caused by growing Islamification of Europe, they found themselves outnumbered more than 20 to 1 by the 4,000 Anti-Fascists. The anti-fascist mobilisation and rally saw members groups such as Unite Against Fascism (UAF) and Anti-Fascist Action (Antifa) from across Europe stand up against far-right extremism and racism. The events were largely skirmish free despite police fearing violence with Danish members of Antifa, the group believed to be heavily involved in violence which followed the eviction of squatters from a Copenhagen youth centre in 2006, planing to take part in the anti-EDL march. It was clear though that the tense atmosphere around the proceedings was only amplified by the start of the trial this month of Anders Behring Breivik, the far-right extremist and anti-Islamist who confessed to the murder of 77 people in Norway last July. The EDL plan to have a national mobilisation in their birthplace, Luton on May 5th. After today it will be clear to Tommy Robinson and his far right thugs that Britain’s anti-fascists will be ready to meet the, on the streets. H&B really are taking the piss; having announced that no less than a quarter of their workforce is to be unpaid – and heavily subsidised by the taxpayer through the offices of Chris Grayling’s mendacious cronies. So it was with some relish that we descended on our local purveyors of quack remedies to neurotic old hippies. Under the banner of Wessex Solidarity, members of IWW, Solent Solfed, Portsmouth Anarchists, Bournemouth Uncut and Surrey/Hants Afed picketed two branches of this bogus medicine show, later we were joined by a couple of SWP. A letter was handed to staff explaining the action along with a copy of Solfed’s Workfare Pamphlet. Our ginger ninja on the megaphone harangued passers-by with her acidic wit while the punters scurried in in search of cures for their creaky joints, failing eyesight and uncompliant third leg. The manager showed up: “are you allowed to be here?” What? On a pavement in a shopping precinct on a Saturday! He claimed to be ‘creating jobs’ then bemoaned the fact that we were going to cost him his £59 bonus; we were all set to move on to the next one when we found out he’d called the plod with some spurious allegations so we had to hang around on principle. “Who’s in charge?” – where do they get it from? Our letter now in the hands of babylon we can all expect some traffic on our web sites over the next few days. As time was cracking on the group then split, a second H&B was picketed while Bournemouth uncut did their thing at vodafone. Having run out of fliers we reunited in top shop on our way to the pub; we brightened up when the guvnor announced security were going to “remove us using force” but they evidently didn’t fancy it and called plod again. I think it was the same copper, they all look the same to me. One thing that struck us from talking to people was how many posties there are who are pissed off with their jobs and their union. if any CWU members are reading this give us a shout and we’ll put you in touch with others who want to do something – and don’t forget the picket of CWU headquarters on Monday! As part of our responsibility of providing English information on Turkey with a political perspective that is compatible with our stance, we start a series of translations of news items and articles on the transformations in the health care system in Turkey. After the first two news items that introduced the current political situation, we continue our series with a political analysis (“Sağlık’ta Alınan Yol ve Ortaya Çıkan Tehlikeler”), published in Bianet on August 8th, 2011. The article, signed Ayşe Buğra and Volkan Yılmaz, discusses the long-term and middle-term consequences of the current policies, which have become more and more apparent in time. An approach to introduce a health care reform in contravention of the medical doctors is doomed to failure especially with respect to protecting patient rights in the long run, and this long run might be a much nearer future than presumed. It has long been told that the Justice and Development Party (AKP) government’s health care policies constituted probably the primary reason of its success in the last election, and that especially the poor were highly contented by these policies. Yet, we know that the Turkish Medical Association (TTB), the medical doctors’ institutional representative in Turkey, objected to these health care reform policies. Thus, on March 14th , TTB organized one of the most broadly participated and most vibrant demonstrations of the Republic’s history in the domain of health care policies. There is a clear gap between the spirit of the medical doctors’ demonstration against the contemporary health care reform and the optimistic analyses about the positive social effects of the plan. This seems well worth an explanation. And this explanation should take into account the historical background that fed into today’s health care policies, contradictions within the current health care reform and the problems this reform may cause as well as its short-term positive effects in the lives of the citizens. The former health care system of Turkey had quite important problems. In the former system, there were three public insurance schemes: one for civil servants, one for blue collar workers and one for the self-employed and the farmers. These three public insurance schemes collected different premium rates and provided their members with differential access to health care services. In the former system, civil servants constituted the most advantaged group. In contrast to the satisfaction of civil servants with the former health system, blue collar workers and farmers could only get access to crowded public hospitals that provided low quality health care services. In addition to the inequalities within public insurees, the former system excluded the informally employed and the unemployed (who do not have a formal worker or a pensioner family member), namely a large segment of the society most of which is poor. In short, the former health care system failed to provide access to health care services, which is one of the fundamental social rights, on the basis of equal citizenship. As the number of people excluded from the health care services drastically increased in the aftermath of the neoliberal restructuring of Turkey’s economy, the coalition government of center-right True Path Party (DYP) and center-left the Social Democratic Populist Party (SHP) decided to address this social problem. Former Minister of Health Mr. Münif İslamoğlu from DYP put forward one of the most interesting arguments during the parliamentary debates. Mr. İslamoğlu argued that health is a fundamental citizenship right and therefore a policy that requires citizens to prove that they are poor in order to access to health care services is unacceptable. On the other hand, the proponents in DYP tried to convince İslamoğlu that Green Card policy would be a temporary solution. This policy would be replaced by a general health insurance policy which was to be implemented in the near future. Despite the logic of the Green Card policy being contrary to the equal citizenship ideal, the Green Card policy can be regarded as an important development for Turkey’s welfare system since it has provided the poor with access to inpatient health care services. The AKP government extended the benefit package of the Green Card that started to cover outpatient health care services as well as medications. AKP eliminated the differences in benefit packages among three public insurance schemes and the Green Card scheme. All public insurees have become free to choose which public hospital they want to receive treatment from. Especially this part of the reform increased the quality of health care services so that blue collar workers, farmers and the poor could get access and it highly contributed to the social legitimacy of the AKP’s health care reform. However, these positive developments are not enough to compensate the inherent problems of the AKP’s health care reform. One of these inherent problems is the question of the soundness of financing the health system by premium payments rather than general taxation. Insistence upon public insurance based financing of health care is especially problematic due to the high prevalence of informal employment. In addition to the possible difficulties in collecting the premium payments, the current health care reform keeps income means-testing intact and thereby the bifurcated citizenship status in the domain of health care. Implementation of income means testing in the Green Card scheme has always included a certain level of discretion. Public officials have a strong suspicion about the applicant’s real and declared income levels. Current health care reform aggravates these problem-ridden aspects of the implementation of Green Card scheme. Increased suspicion of public officials against the Green Card applicants will result in the cancellation of the Green Cards, thus the denial of these citizens’ access to health care services. Green Card scheme had always been open to the discretion of politicians as well. This became visible when a provincial administrator threatened Kurdish families to cancel their Green Cards if their children would continue to participate in demonstrations against the AKP government. Even though this provincial administrator could not realize his threat, this event once again demonstrated that the implementation of the Green Card scheme hardly corresponds to a rights-based social policy. Secondly, the neoliberal approach of the contemporary health care reform manifests itself in its market-oriented approach to the production and delivery of health care services. This is also observable in the introduction of performance-based premium as a significant pay mechanism for medical doctors. In this regard, we should not forget that the doctor-patient relationship should not be treated like any other market relation between vendors and purchasers. Relationship between doctor and patient should rather be a relation of mutual trust based on the medical ethics that assumes patient’s well-being. Once this is neglected, the economic and vital consequences can be quite hard. * Ayşe Buğra, Professor, Boğaziçi University, Social Policy Forum. * Volkan Yılmaz, the School of Politics & International Studies, the University of Leeds. This translation was read and edited by Volkan Yılmaz before publication in order to terminological coherency. [ii] For instance a recent research based on hospitals shows that the promotion system significantly increased the number of examinations, operations and visits to the polyclinics. Çağla Ünlütürk Ulutaş, Türkiye’de Sağlık Emek Sürecinin Dönüşümü, Nota Bene Yayınları, p. 318-337. A lively demonstration was held outside the gates of EDO at lunchtime on Thursday 29th March. 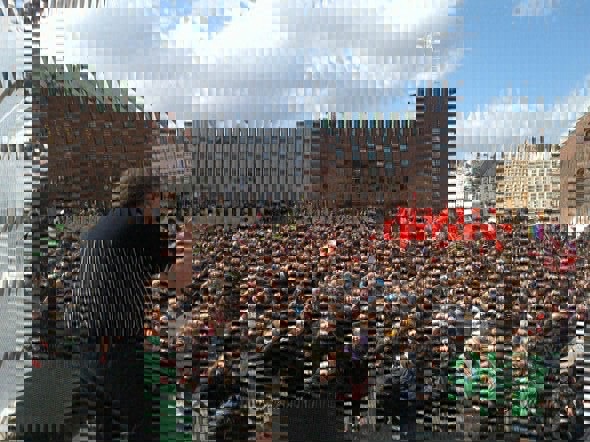 On Wednesday 28th A noisy demo was also held . 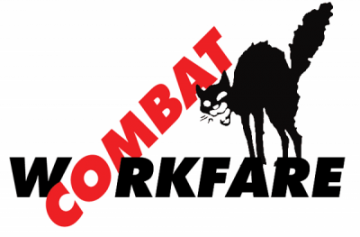 March 31st day of action against workfare! In support of the three days of action against austerity called by the International Workers’ Association and the M31 European day of action against capitalism called by various groups. We intend a picket/leaflet of one of the national firms participating in a workfare scheme, in the Bournemouth area. This will be followed by a communications blockade on the 2nd. The lucky recipient of our attentions will be revealed in due course – watch this space – but I bet you’ve got a pretty good idea! This is a nationwide initiative originating from the Solidarity Federation but now taken up by a wide range of anti-workfare groups across the country. Provisional meeting point Flirt Cafe Bar 11:00. This is intended as a non-sectarian demonstration of working class unity, so please invite anyone you think would like to come. New Radical blogs from the Philipines. Food Not Bombs shares free vegan and vegetarian meals with the hungry in over 1,000 cities around the world to protest war, poverty and the destruction of the environment. With over a billion people going hungry each day how can we spend another dollar on war? Started in mid – 2011, Mindsetbreaker Press/Distro is maintained by a tiny number of people specifically working on publishing and circulating anarchist literature at the local level, besides existing projects and campaigns being carried out by members; such as infoshops, info events and other autonomous activities. We also want to reach local anarchist politics abroad and hope to build solidarity with people in other continents in whatever way possible. Mindsetbreaker Press and Distro operates in the local anarchist infoshop that almost run out of money to pay for rent. We wanted to sell our journal abroad to keep our press and distro going, publish more local literature and raise some extra money to pay the rent of the infoshop, 3,000 peso a month.